Since starting this course I have made a deliberate effort to include Geogebra in my lessons, particularly with Year 10 Stage 5.3. These students are genuinely interested in the process as well as the result and have picked up the use of sliders and dynamic text very quickly. They are now asking if Geogebra will be included each lesson and their investigative skills have really kicked on. The discussions that have evolved through Geogebra have been pleasantly surprising. I have also worked with Year7 and 8 classes, initially demonstrating some concepts, however it wasn't long before the students wanted to drive the lessons and get some hands-on experience. Demonstrating some more complex concepts with advanced files has also encouraged some of the more capable students to explore further. 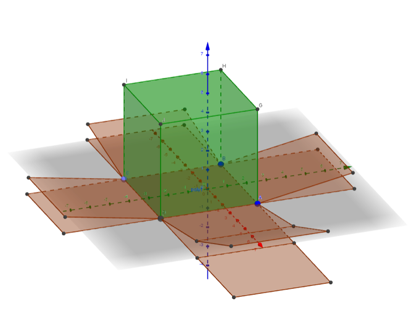 I now look forward to 2019 and including Geogebra in the new Senior Mathematics Syllabus lessons. I have used Geometry concepts, Linear Relationships, Data, and Trigonometry Geogebra concepts to date with high levels of success. I have also watched a former staff member, who is very skilled in Geogebra, teach and engage students for years. I now feel confident enough with Geogebra to create my own engaging lessons that will be both teacher and student-centred and hopefully drive students to succeed in Mathematics in the years ahead. Prior to this course I had mainly used GeoGebra for geometry and coordinate geometry. Since starting the course I have used it for the first time in Bivariate Data, Quadratics and Parabolas, Pythagoras and I am starting to build some resources for Calculus. Within the scope of this course I have been confined to demonstration only, mainly due to issues relating to timing, topics currently under study, access to technology resources etc. In the past I have used it for student investigations such as graphing various linear or non-linear relationships, screen-grabbing and dumping into a Word file for upload to me via the school website. I have not used it particularly extensively, yet. I have a bank of already made resources that with my new knowledge I can fully assess for suitability in my classroom, and I am adding to my own creations. Today, I got to use my Quadratic Roots file and it worked really well in supporting the lesson on the features of quadratic functions. 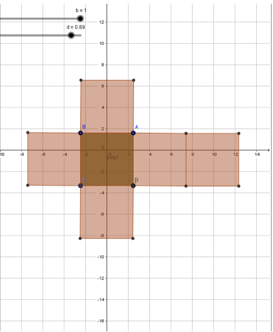 The students thought it was amazing when I moved the sliders to change the values of a, b and c and it was really effective for demonstrating things such as the axis of symmetry, intercepts and vertex. It was really powerful and worked much better than expected. The Pythagoras' file I used with Year 9 a week or two ago was not so successful. Too many numbers for that class... It was still useful, but not as much as I'd hoped. Maybe with a higher ability class. I have had a few 'light bulb' moments with GeoGebra in the past and will be paying a lot more attention to what works in that regard and what doesn't and with what classes/levels. With regard to future use, I will be continuing to build up resources, organise them effectively, refer to them in my programs and reflect on their success regularly. I would like to make these sorts of things accessible to my students online. As a specific example, if I get a 2 Unit class for next year, I will be utilising GeoGebra extensively to try and build the conceptual understanding necessary for success. I'm thinking this could work through a flipped classroom type model, even if I don't use this approach exclusively (let me work up to that!). So far I have the file on the area under the curve as rectangles, and I have made a version of one I saw at a TPL that plots the gradient function to allow students the opportunity to 'figure out' the rules of differentiation before being told them. I have ideas for others and a number of existing files to review. If I don't get a 2 Unit class, my daughter is starting Prelim 2Unit next year so I'll try them out on her. Thank you Richard for opening up GeoGebra. Unfortunately, I am now even more aware of the scope of this software and feel like there is still sooo much to learn! I am well and truly on my way though and feel like it is definitely having and impact on my classroom already, plus I'm much more confident about it all too. Thanks again! Students have been struggling to draw nets of solids. My idea was to create a file to help them see unfolding and for them to physically manipulate the unfolding. We have tried this by building our own cubes and other polyhedrons, however students could not really cope with the cutting and folding. It is a class of nine (9) students who really struggle with all kinds of concepts and after seeing the file in actions they seem to be more open to trying to draw the nets of the solids. It helps if the can use the interactive board (in my case an Epson projector and EasyInteractive Tools. The boys really respond to Geogebra. Now that I have a “recipe” to draw and represent regular solids 2D, their nets and 3D it makes learning fun as we are able to quickly go through all the solids the boys suggest. The boys explored solid, named them, determined number of faces, edges, vertices. They learnt a few basic formulas for area of squares, rectangles and triangles. They were introduced to basic construction of a square versus drawing a square in Geogebra. I think they understand the difference now. ​I introduced a file which had a square and the 3D window showing the solid. It is not that hard to learn how to use the 3D component of Geogebra, but it enhances the power of what you want to show. I used the unfolding of the cube to allow the boys to see the faces, count them and even had the counting the squares to determine the area. This could easily be made dynamic but I tried to keep the pictures not too busy. The students could easily manipulate the figures using sliders. See screenshot. The students each get a printout. Again, the files was used to demonstrate the difference between drawing and construction in Geogebra. Student enjoyed the use of the file as a demonstration of the relationship between the areas. I used colour to get students to see the relationship clearly. Even though these are simple examples of Geogebra file I am hoping that in the future our students learn to create files themselves. I have used Geogebra as a demonstration tool in a variety of topics prior to doing this course. I found it particularly useful in teaching Circle Geometry to Extension 1. I had attended an Ext 1 course through MANSW and we were given resources which included premade files for all the Circle Theorems. I used these files to demonstrate the theorems and the students responded well to them, allowing them to grasp the concepts visually and apply them to problems mathematically. In my work on Parametrics with Ext 1 I constructed files by following step by step instructions in the textbook and found them to be helpful in teaching a section of work the students normally find challenging. Since doing this course I have now got the confidence and expertise to construct files on my own. I am constantly thinking of how I can integrate Geogebra into my teaching of topics in all years of study. I have found the course to be both interesting and challenging, in fact it has been all consuming of my thought processes. I have woken up on many a morning feeling like I had done Geogebra all night, thinking up ways to construct the files and present them to the students. I feel that my teaching practice has benefited greatly from doing this course as in the construction process I have had to think more carefully and logically in my development of the mathematical concepts. My students have responded positively to the implementation of Geogebra into my lessons. It gives them a visual platform from which the concepts are projected, they immediately see how things work and understanding is immediate. I would like to extend my knowledge and expertise in making more student directed files that allow students to work through the unit of work at their own pace and giving them the flexibility to go back and look at concepts which need reinforcing. Much like how this course has worked for me. We are restricted in our use of technology at school, as not all students have their own device and it is impossible to book a computer room for two or three consecutive lessons. I am not going to let this problem deter me from developing student directed files for units of work like Quadratic functions. I have loved learning new things at my own pace and have enjoyed getting immersed in the processes of Geogebra. ​I taught the concept of circles and the measure of central angles inside the angles using real circles and real angles, making the circle in carpentry, it was a good idea and it eases the process of learning, but geogebra make the concept more easier for students, and made students more eager to solve every theorem circles by geogebra, they discover new things in circles. Can I just say that this course has given me the confidence to use Geogebra . I find that I’m thinking about Geogebra all the time always asking “how can I show this in Geogebra”. The course has given me a confident understanding of what can be done and how to develop resources for my classes. About halfway through the course I started using Geogebra as a demonstration tool in particular the topics of Quadratic functions and the discriminant. It was very useful in demonstrating the properties of the discriminant. What was best was how the class could instantly see results. I have most recently used Geogebra to demonstrate the gradient function to my year 11 mathematics students. With some students struggling with this concept I was able to demonstrate in Geogebra to get that "aha" moment. It felt great.!! This experience has inspired me to get more moments like this in my teaching. Most importantly the struggling students felt great as well as they had the sense of understanding the concept. It was unfortunate that I did not have the file ready at the beginning of the topic where it would have the had most impact. Those students who understood concept found the demonstration helpful in visualising the concept which strengthened their understanding. What I like most about Geogebra is that it is instant especially when graphing functions and their properties. 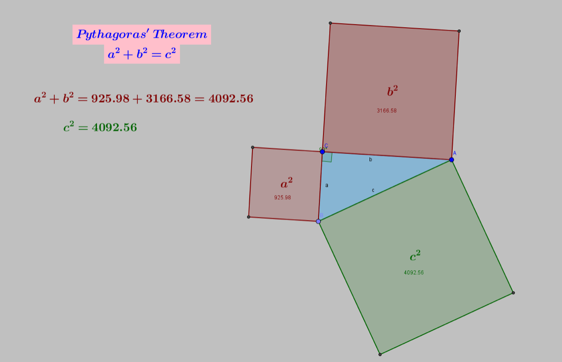 I plan is to use Geogebra more and more in my lessons to demonstrate properties and theorems. It is a wonderful tool to enhance and engage students in the learning process. By understanding the fundamentals of a topic students are better prepared for problem solving tasks ahead. My aim now is to build files to assist with understanding for topics studied in 2U and 3U mathematics. I thank you Richard for developing and delivering this course as self-passed. I look forward to other self-paced course. This has given me a much needed insight into Geogebra. I have heard lots about and had used it a bit but was amazed by the depth of what is available. The files i used with my Year 9 and 10's were mainly for demonstration purposes. I got them to do a little construction but it was taking too long for them to do (they were using Ipads and this had its own issues). I reverted to mostly demonstration and working through the completed files on the board. Some of them i took a risk and created as i was explaining. It actually worked quite well. I was surprised how well it worked. The students loved the interactive nature and the ability to manipulate files once they were created. I definitely will continue to use Geogebra and involve the students in creating files of their own. It is a little disappointing that the Ipad version is not as comprehensive but probably quite adequate for the students. Thanks for a great course Richard. I have just started using GeoGebra in a fairly straightforward manner. At this early stage, I am mostly referencing files that other people have created (of which there are thousands). I can't believe it has taken me this long to start to use GeoGebra. Just this afternoon in introducing Parametrics, I was able to throw up x^2=12y on the whiteboard and right in front of the students' very eyes, plot a focus (0,3) and a directrix y=-3. The students were pretty impressed given that 99% of the time, I use a whiteboard marker. I then proceeded to draw all over the diagram, all over the board, with a marker. This sure beats a one metre ruler. Students seemed to get the idea of different values of a generating different shaped parabolas. The diagrams were certainly far neater than anything I could draw. As a result of doing this Professional Development course, I am fully intending to use an adaptation of one of Richard's files to introduce Differential Calculus to my Year 11 class next week. I am extremely thankful for Richard's input and support during my learning and for the terrific course he has developed. The old dog has learned a new trick. Here's another example of a simple-yet-very-effective GeoGebra file. GeoGebra is extremely powerful for junior and senior measurement units and, in fact, for many mathematical concepts involving formulas. The file below - upon which the gif was based - was created by past participant Peter Currie.